International manufacturer Roxtec is helping protect Britain's new £200m ($265m) polar research vessel - RRS Sir David Attenborough - after supplying a range of specialist safety seals. The new build ship is being funded by the Natural Environment Research Council (NERC) built by Cammell Laird in Birkenhead and run by the British Antarctic Survey (BAS). It will operate in extreme conditions in both Antarctica and the Arctic, enduring up to 60 days in sea-ice for scientists to gather data on the climate and oceans. Roxtec UK Managing Director Clive Sharp said specialist seals will be installed in key areas including the engine room, power generators and external lighting. They will provide protection from multiple hazards such as fire, water, gas, vibrations, electro-magnetic disturbances and explosion. "Roxtec was introduced to this ground-breaking project by Norwegian electrical contractor Vard," he said. "We have since supplied a number of transits and continue to deliver cable and pipe seal add-ons. Roxtec's sealing solutions are widely regarded as the best in the world offering a series of benefits including durability, flexibility and simplicity. They are not only quick to install, they are openable and adaptable to cables and pipes of varied sizes, and come with built-in spare capacity for future upgrades. In addition, our products reduce overall weight, helping operators use less fuel and reduce ships emissions." Mr Sharp said the Roxtec Transit Designer software is also helping engineers save time and money. "This software has been developed by Roxtec and is free for engineering companies to use," he said. "It has been used to great effect on the RRS Sir David Attenborough project allowing engineers to improve the entire design, purchase and installation process for cable and pipe transits. 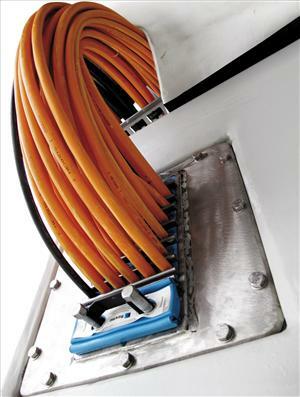 Cable routing can be complex and subject to constant change, but this technology makes the process straight forward. Engineers just enter their cable schedule, sealing requirements, installation preferences and preliminary opening sizes. The software then generates manufacturer-approved drawings and helpful documents such as material lists and installation instructions. This simplifies product selection, drives efficiency and reduces project risks." Roxtec's Marine & Offshore division is responsible for around a quarter of the firm's UK turnover and has recently invested in additional manpower to target shipyards and engineering companies across England and Wales. The firm is currently targeting projects with carriers and cargo ships, cruise liners and ferries, offshore support vessels and superyachts. It is further eyeing the UK defense and naval sector in line with the National Shipbuilding Strategy. "Our safety seals can be used across many applications in the maritime environment," said Mr Sharp. "The main areas include cabinets and enclosures, engine rooms, lighting and communication applications, fire sprinkler systems, hydraulic and compressed air systems, power generators, motors and thrusters along with power supply substations." The global firm has 25 subsidiaries and is active in more than 80 markets worldwide.